I was having thoughts of chocolate yesterday. Lots of chocolate. And a bit of a desperate longing for wine too. I was going to hang out till Sunday for my high-calorie day, but I was beginning to doubt that I could make it that long. I had that teetering on the edge of a binge feeling. 2) Post workout meal - high-protein muesli, Protein Crunch, banana, yoghurt, honey. 3) Tuna with zucchini and potato patty thingies (basically a use-up-whatever-veggies-are-left kind of deal), stuffed zucchini and salad. Huge. Tummy-bursting from all the fibre kind of huge. Of course I blew my carb ratio right out of the water, but calories actually came in under my planned 2100, so not a big deal. Only the wine is missing. I actually walked into Liquorland after buying the M & Ms at Coles, with every intention of picking up a bottle of cheap sauv blanc, knowing damn well I'd end up drinking 75% of it. I wavered, reached out for the bottle, then pulled my arm back... reached out again, and then turned around and marched out. The girl behind the counter probably thought I was nuts, but so what? The devil on my shoulder lost that battle of wills! 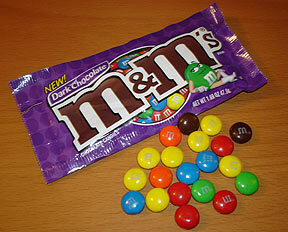 I was devastated to discover a sticker on the shelf at Coles stating that the dark choc M & Ms are a discontinued line. *sob* I thought about buying the entire stock, so I'd still be able to have them for a while, but decided that having 8 or 9 packs of one of my favourite treats in the house is probably not one of my more brilliant ideas. LOL - as Homer Simpson might say: M & Ms...is there anything they can't do? Reading you loud and clear! I'm hanging out for tomorrow night and my M&M's. They're staring me in the face everytime I open the pantry. BTW, thanks for only introducing me to a little packet. Any bigger would have been dangerous. Nice work on being intuitive and listening to your body before it was too late. Thinking out loud now perhaps I should have had my treat tonight and carbed up also since Liz will be kicking my arse in RPM tomorrow morning! Shelley, you SO need those M & Ms tonight. Don't you know they're compulsory pre-RPM nutrition? Good work on the wine - it's just a slippery slope from there. Enjoy the rest of your weekend!